BlueCore Technologies offers planning, strategy and management of IT networks and systems for companies across Tennessee. 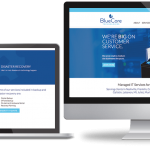 As information technology experts and a small business themselves, BlueCore and Nashville Geek found an easy partnership to create a custom, mobile responsive WordPress website for the IT company. We didn’t even have to translate the geek speak!